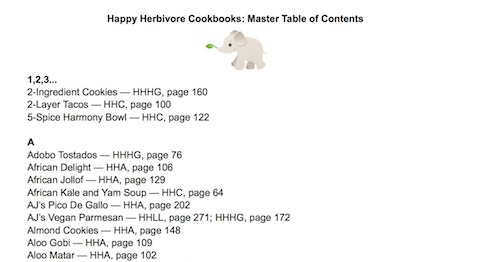 Now that my latest cookbook Happy Herbivore Holidays & Gatherings is out, we've updated the "master" table of contents of Happy Herbivore cookbook recipes! The latest version includes recipes from all five Happy Herbivore cookbooks (The Happy Herbivore Cookbook, Everyday Happy Herbivore, Happy Herbivore Abroad, Happy Herbivore Light & Lean, and Happy Herbivore Holidays & Gatherings), which are listed in alphabetical order with their page numbers. Download and save as a PDF file on your computer or device, or print a copy for your kitchen, whatever makes finding your favorite HH recipes easiest for you!